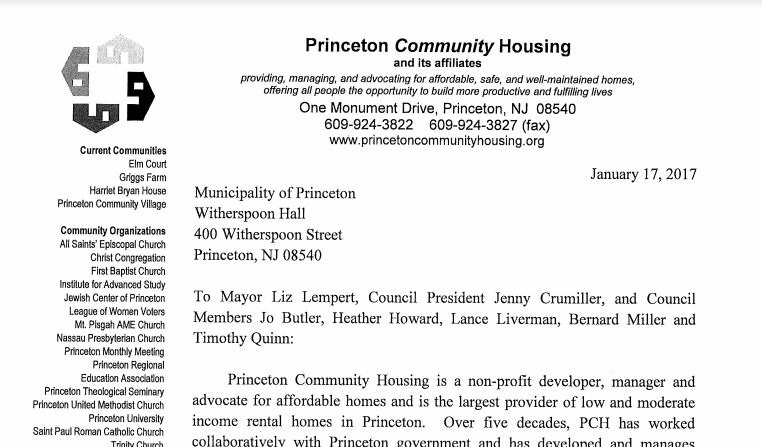 Rich Gittleman, the President of the Board of Trustees at Princeton Community Housing, has addressed a letter to Princeton Mayor Liz Lempert and the members of Princeton Council, urging an end to the town’s current legal fight over affordable housing. The open letter is being published in local media outlets (click here to view the full letter, or click here to read the full text at Planet Princeton), and points out that the town’s legal action is specifically intended to reduce affordable housing numbers. Princeton Community Housing is a non-profit developer of affordable housing, which has been operating in town for decades. PCH runs affordable housing developments such as Princeton Community Village, on Bunn Drive, and the mixed-income Grigg’s Farm Development on Route 206 at the north of town. It has traditionally been supported by local religious communities and a broad base of advocates dedicated to advancing fair housing. Mr Gittleman points out that many New Jersey communities have already settled their affordable housing obligations, and it should be easily possible for Princeton to do the same. He calls for a restart of a community dialog about how to incorporate affordable housing into the community in a way that enhances the character and diversity of the town. The letter is likely to add to pressure on local elected officials to end their ongoing legal fight to reduce affordable housing obligations in Princeton. A petition circulating in the community currently also has close to 200 signatures of local residents, urging an end to the legal battle (view/sign it at this link). In related news, the New Jersey Supreme Court yesterday ruled against a coalition of New Jersey municipalities who were aiming to eliminate afforable housing requirements from the period 1999-2015. The towns were represented by attorney Jeff Surenian, whose work has been funded by the municipality of Princeton since at least 2015. This entry was posted in Affordability, People, planning, Princeton and tagged Affordable housing, coah, mount laurel, planning, Princeton. Bookmark the permalink.